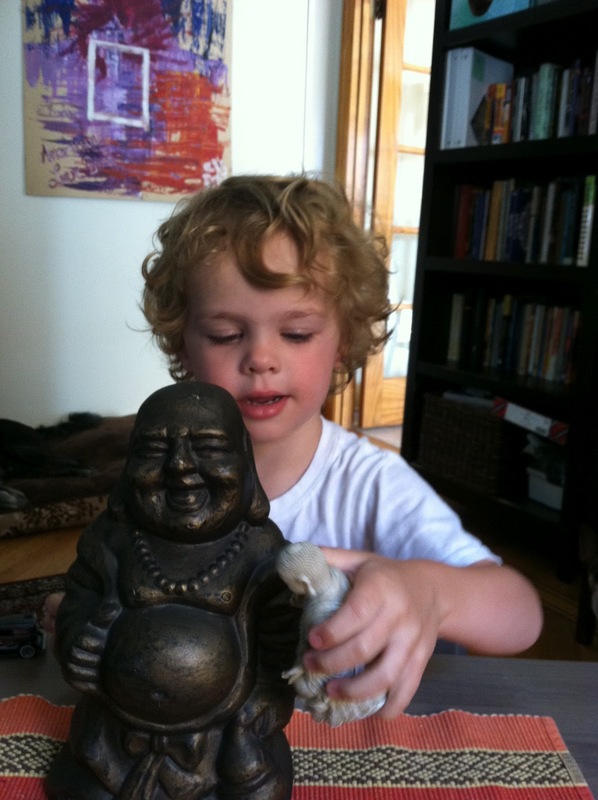 You might assume from this photo that Jack is a very enlightened little dude. Serene, contemplative, way ahead of his years. Or you might have taken it one step further and are assuming that I, his mother, am enlightened, serene, contemplative. Well thank you for assuming the best about us…Here's the real story. I sat watching my 3 and a half year old engaged in imaginative play with 2 Buddha statues a while back. 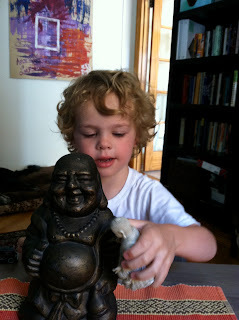 Little Buddha was suggesting all sorts of fun things he wanted to do with big Buddha. "Let's high five!" and so they did. Little Buddha gave big Buddha a kiss. Little Buddha eventually decided he wanted to go for a ride in the Scooby-Doo Mystery Machine and left big Buddha behind. There's a lot going on behind this story. 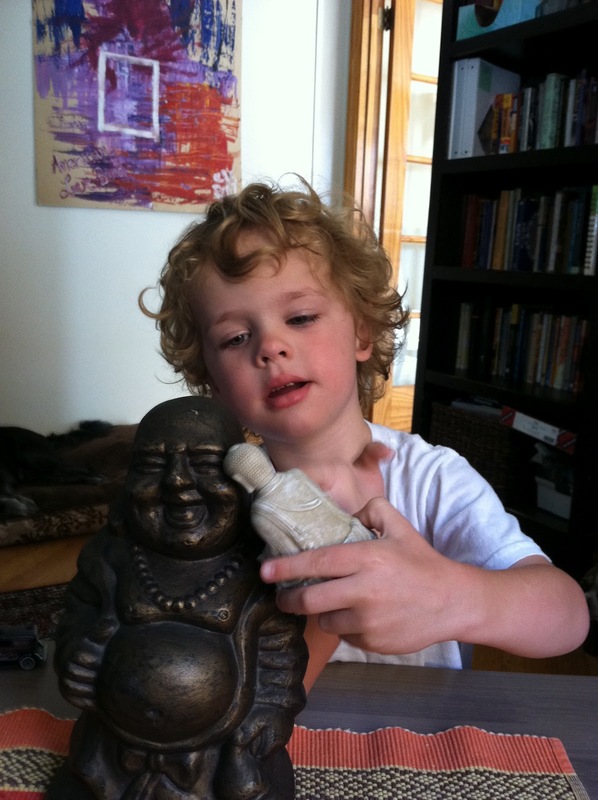 Little Buddha happens to be the object that was my focal point during labor with Jack. I sat in a warm jacuzzi tub with Buddha perched on the lip of the tub just in front of me and between my legs. For something like 2 hours little Buddha with his left hand palm up and resting on his thigh (come), and his right hand held up and facing out (do not be afraid) watched me watch him. Through each contraction and every push (come, do not be afraid). No we here at the Mulligan household are not any closer to enlightenment than you are. We are rarely serene and contemplative. Just being takes a whole hell of a lot of work and the truth is Jack is a whole lot better at it than i am. But here is the thing, while enlightenment may be a ways off yet, our progress is stunning. That Jack took it upon himself to animate the Buddhas and engaged his imagination in this way is great progress for him. That he used lots of words and full sentences is great progress for him. A year ago when we discovered he was speech delayed and he was not creating sentences at all I just kept telling people, "He's listening. When he has something to say he'll say it. He's got his own agenda." I still think those things were true but I also admit I'm rejoicing in his rapid progress: the blossoming of his language and imagination are what make being a parent really, really cool right now.